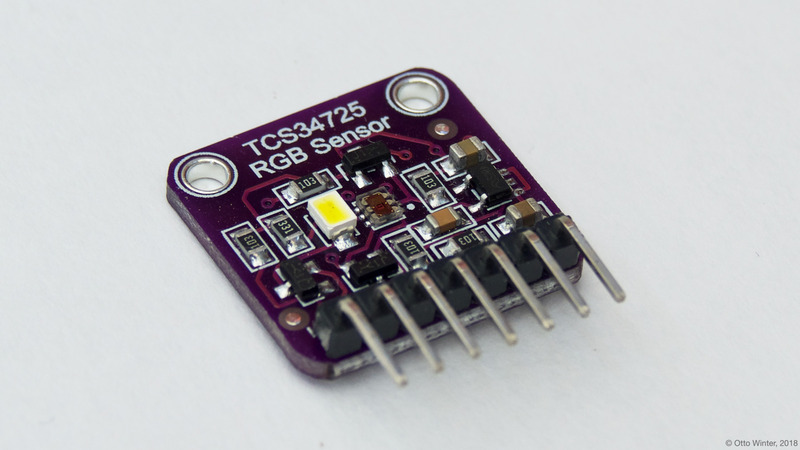 The tcs34725 sensor platform allows you to use your TCS34725 RGB color sensors (datasheet, Adafruit) temperature and pressure sensors with ESPHome. The I²C is required to be set up in your configuration for this sensor to work. 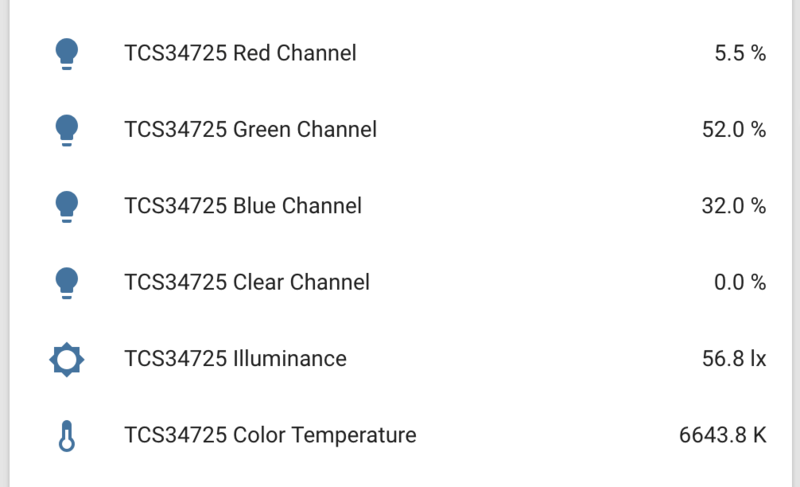 red_channel (Optional): Get the percentage of how strongly the red color channel is activated. All options from Sensor. green_channel (Optional): Get the percentage of how strongly the green color channel is activated. All options from Sensor. blue_channel (Optional): Get the percentage of how strongly the blue color channel is activated. All options from Sensor. clear_channel (Optional): Get the percentage of how strongly the clear (without a color filter) channel is activated. All options from Sensor. illuminance (Optional): Get the total illuminance of the sensor in lx. All options from Sensor. color_temperature (Optional): Get the calculated color temperature of the light in Kelvin. All options from Sensor. gain (Optional): Set the gain for the internal ADCs to work better in certain low-light conditions. Valid values are 1x (default), 4x, 16x, 60x (highest gain). integration_time (Optional): The amount of time the light sensor is exposed. Valid values are 2.4ms (default), 24ms, 50ms, 101ms, 154ms, 700ms. address (Optional, int): Manually specify the i^2c address of the sensor. Defaults to 0x29.